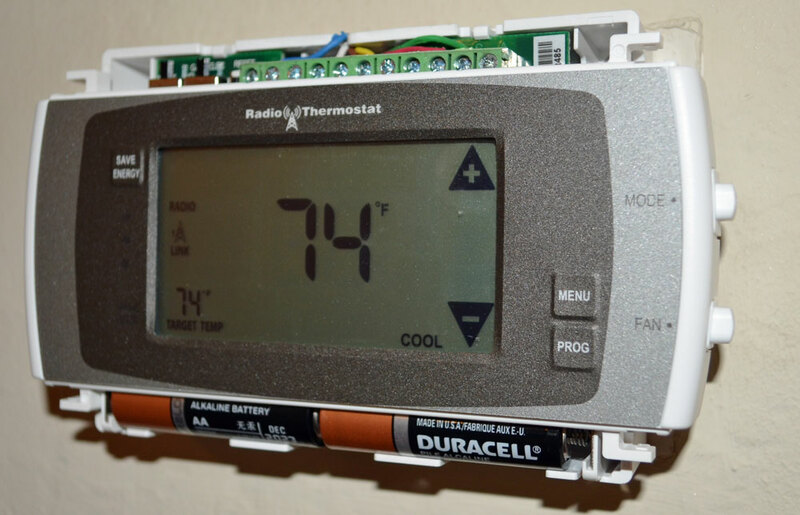 If a big battery icon appears on your Comcast Xfinity Home Radio Thermostat CT-30 that means it’s time to swap out the old ones for three fresh AA batteries. It sounds easy, but the details are important. First step is to get the cover off. Grasp the bottom cover plate and gently pull the right side until the latch lets go of the base. It will require a bit of pulling, but not so much that something breaks. Brace against the body of the unit while pulling. Once the right side is off, gently pull the left side. Do the same with the top cover. This will expose the batteries and the top wires. Next remove the three batteries by gently pushing them toward the spring side and popping one out and then the other, a small flat-head screw driver might help. This will expose a third battery in the back, do the same, pushing toward the spring. Now replace the three batteries with new ones in the reverse order. Be careful to insert the battery toward the spring first so as not to damage the spring. Once all of the batteries are back in place push the bottom cover back into position. The battery icon (not pictured) will still be present on the unit and will not go away until the unit is rebooted (reset). 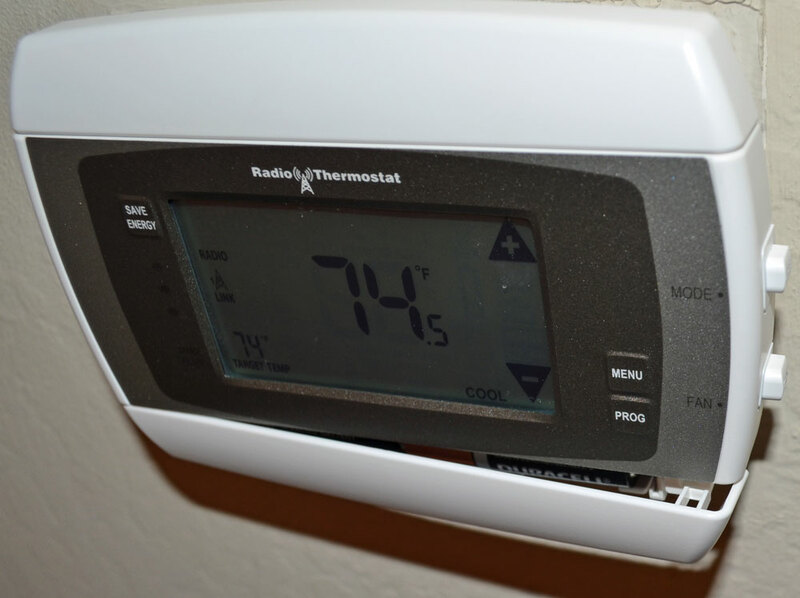 The reset button is located on the top left of the thermostat next to the C wire. Using something pointy press the reset button momentarily and release it, there is no need to hold it down. The thermostat will reboot. No settings or connectivity will be lost. After rebooting the battery icon will go away.